Project 365 - 11/7/2013 - 311/365, a photo by cathy.scola on Flickr. And so ends a really wonderful weekend. As I have mentioned already we had a fantastic day down in Brighton yesterday and today we had good friends visiting and we just had a lovely chilled out day. We even managed to make a good start on our online Christmas shopping this evening. I didn't know what photo to post tonight but I saw this one and I couldn't help smiling. 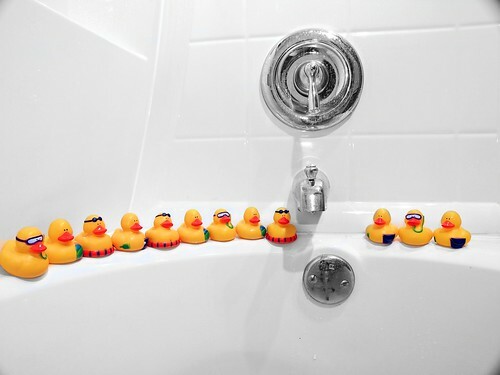 What a cute selection of rubber ducks and such fabulously bright white tiles. Great photo, great bathroom!